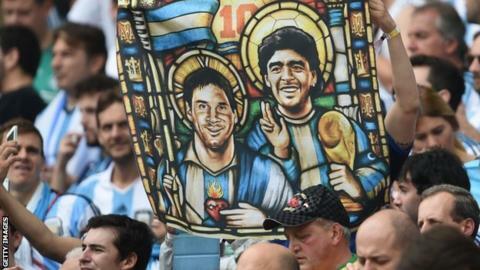 Does sainthood await Messi at World Cup 2014? Will this be the World Cup when Lionel Messi joins the likes of Pele and Maradona in leading his team to football's biggest prize? On Tuesday, the 27-year-old has the chance to move a step closer to what could prove a career-defining tournament success. Messi will be the star attraction on day 20 of the World Cup, but there is plenty going on elsewhere too. Mark Lawrenson: "Switzerland had a topsy-turvy time of it in their group before making it through to the last 16, but this is where their World Cup will end. "I know Argentina striker Sergio Aguero is out but Lionel Messi keeps coming up with the goods when they need him to, and it is frightening to think that he probably has not even got going properly yet. "The attacking football and number of goals so far at this World Cup have been great, but what is making it even more special is to see people like Messi playing the kind of football we know he can. Hopefully there is more to come." Lawrenson: "I have co-commentated on United States matches twice at this tournament, and Belgium should underestimate them at their peril. "On paper, you look at the two likely line-ups and you think Belgium will win - it's a no-brainer. "But USA boss Jurgen Klinsmann has got his side so well drilled, and the thing I have noticed is that they stay on their feet - they do not commit themselves, and they stay in the game rather than dive in to tackle. "So they will not be easy for Belgium to break down and I think this is going to go to extra time and penalties… and I am going for Belgium to win those." USA striker Clint Dempsey has looked pumped in every match he has played in at the World Cup so far, so which Belgium defender will be tasked with stopping him? With doubts over the fitness of Vincent Kompany and Jan Vertonghen, it might be left to veteran Daniel van Buyten to play commander-in-chief in the backline. Has the 36-year-old still got the legs to cope with Dempsey, and the bursts of Jermaine Jones and Graham Zusi? Judging by the stats, it is a resounding yes. In his third match - the 1-0 win over South Korea - the Bayern Munich centre-back covered in excess of 10,000m, more than the team average. The Fifa heat map shows that Van Buyten patrolled an area from the centre edge of the 18-yard box to the halfway line and beyond. Kompany and Vertonghen's fitness could dictate whether he is able to roam as freely or has to play more conservatively. The former Marseille defender is also statistically one of the two best centre-backs in the tournament so far - no-one made more than his five blocks in the group stage. What he says: "We have been snappy in training and have become increasingly strong. "We will pull out all the stops so that on our return we can look our fans in the eye. We will not disappoint them." It has been "James Rodriguez this, James Rodriguez that" - but there are other good young players in this tournament, one of whom is Switzerland attacking midfielder Granit Xhaka. The 21-year-old Borussia Monchengladbach player is one of a host of exceptional number 10s on display at the World Cup. Xhaka was one of his team's few bright sparks in the 5-2 defeat by France - scoring a brilliant low volley from a ball played over the top. He works around the right-hand side of the pitch and provides great support for fellow attackers Xherdan Shaqiri, Josip Drmic and Haris Seferovic, and is keen to get into the box as often as possible - making six runs into the area in the 2-1 win over Ecuador. Up against him will be left-back Marcos Rojo. The 24-year-old Sporting Lisbon player scored one goal and made nine runs/deliveries into the attacking third against Nigeria in the thrilling 3-2 win. However, he might have to repress his instincts to drive forward against Xhaka and his team-mates, who displayed their prowess in attack during their final group match - a 3-0 win over Honduras. Argentina forward Lionel Messi has scored 10 times in his past eight appearances for the country. The only time Belgium have lost to USA in a competitive match was in the 1930 World Cup, when they suffered a 3-0 defeat. The only previous World Cup meeting between Argentina and Switzerland was in 1966, when the South Americans won 2-0. Xherdan Shaqiri's hat-trick in Switzerland's final group game against Honduras was the 50th in World Cup history. Switzerland have won just one of their previous six World Cup matches against South American nations - the one victory coming against Ecuador in this tournament. USA will be hoping to go one better than they managed in 1994, when they also made it through to the last 16 of the World Cup. On that occasion they were knocked out on home soil 1-0 by eventual champions Brazil. Not the most memorable of matches, one image remains from that game - the moment Brazil left-back Leonardo was sent off for thrusting his arm at midfielder Tab Ramos. Ramos, who was playing for Spanish club Real Betis at the time, suffered a skull fracture and had to go to hospital. "I got from him all anybody could hope for," said Leonardo, who visited Ramos at the Stanford University Medical Center. "He not only accepted my apology, he wished me luck in my career." Footballers eh? Forgive and forget even after a skull fracture. Forget the Rio Carnival, Sao Paulo - venue for Argentina versus Switzerland - knows how to party. The Grupo Especial is a competition featuring 14 of the top samba schools in the sambodromo (an exhibition of samba schools). The schools, each with their samba theme, try to impress the judges and the viewers at home, with the event televised. Themes in the past have included a century of Japanese immigration to Brazil and the deliciousness of chocolate. It may not match the standards and flavour of Rio, but it is still as colourful and bold.